Léopold Robert (1794-1835), L'Arrivée des Moissonneurs dans les marais Pontins, 'The arrival of the reapers in the Pontine Marshes', 1830. ©Musée du Louvre, Paris. Online. [Click on the image to open a large image in a new tab, 2000 x 1340 px, 525kB]. 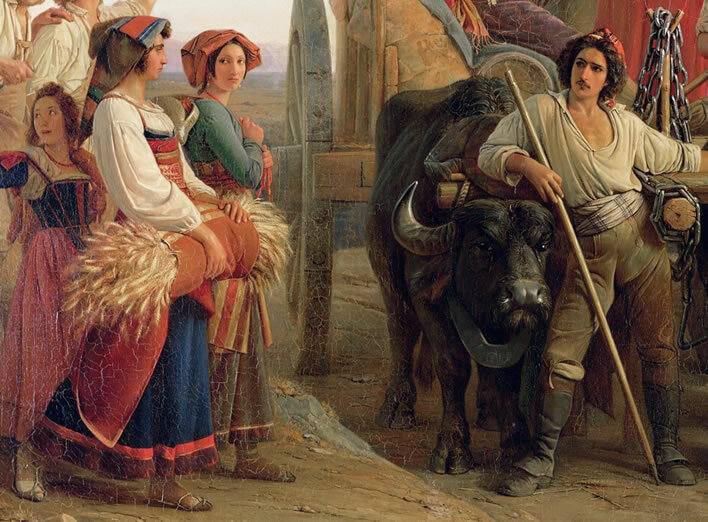 Detail, the eyeline left: A tense gaze between the cocky young man posing between the buffalo and one of the reapers walking towards him. Her companion is giving her what used to be called 'a knowing look'. Detail, the eyeline right: All eyes on the dancing duo, even the girls behind them. The young man with the flowers in his hat is unfurling(?) the tent poles and canvas. The old man has his hand on the young man's arm, appearing to restrain him(?). He is looking down at the cocky young man standing between the buffalo and appears to be saying something to him. The meaning of all this is utterly obscure. 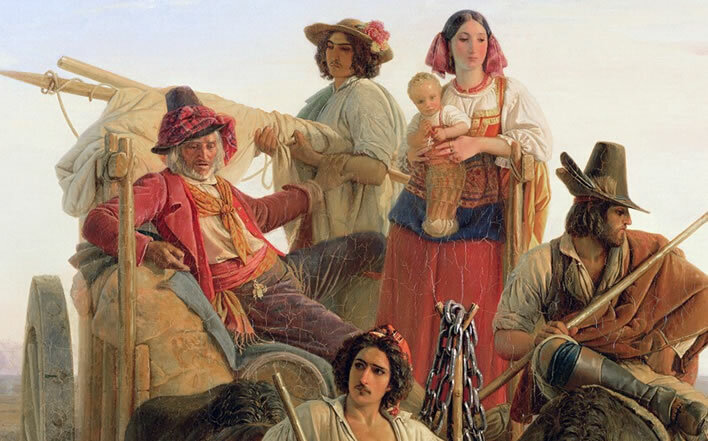 Robert's painting was one of the most popular genre paintings on the continent in the second half of the 19th century. 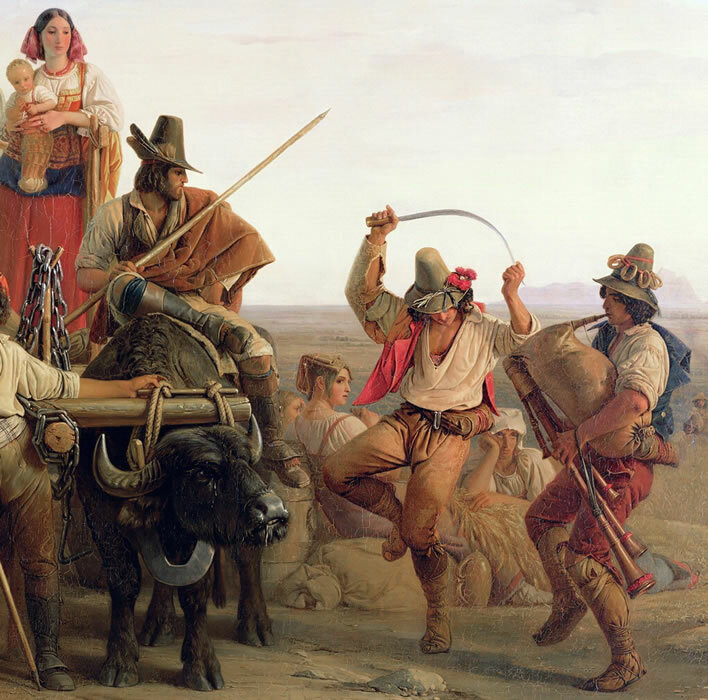 It is poor stuff, well painted: the buffalo are centre stage, occupying the centre third of the picture; the human characters form an arc in their groups over the waggon; there is no connection across the picture, which thus falls into two halves; everyone in the picture looks suspicious and angry. Yokels should be cheerful, otherwise what's the point of them? 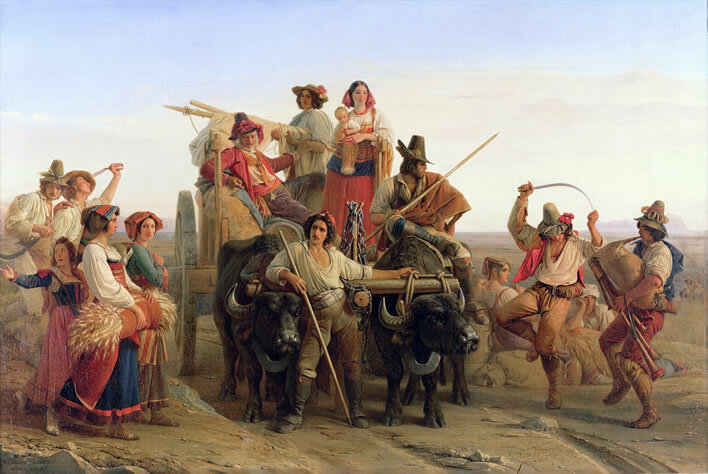 The action in the painting is incomprehensible: the arrival of the ox-cart, its purpose, the roles of the people on the cart and the people surrounding it, who seem to have completed their work already – puzzle upon puzzle. The painting just seems to be a way of displaying strange latin people in odd costumes for the amusement of the northern gallery-visiting set. Robert was a depressive, who eventually killed himself in Venice in 1835 by cutting his own throat. This work was the peak of his reputation, he is nowadays barely known. Nevertheless, a lot of people seemed to like the painting greatly for whatever reason: two of them were the great German writer Heinrich Heine (1797-1856) and the great Swiss writer Conrad Ferdinand Meyer (1825-1898). In Robert's painting we see a bare region of the Romagna in a radiant Italian evening light. The magic of the picture comes from its colouring. The figures, who are all darker than the background, are illuminated by the light of the heavens in such a heavenly way, so wonderfully, that they glow in the most joyful, light colours yet retain their clear contours. 'God is in everything there is'. Robert's reapers are therefore not just free of sin, but rather know no sin: their earthly labour is reverence, they pray continually without moving their lips, they are blessed without heaven, redeemed without sacrifice, clean without continual washing - quite holy. When in Catholic pictures just the head is given a nimbus, so we see in Robert's image that matter has been blessed, in that here the entire human, the body as well as the head is surrounded by heavenly light like a glory. Heinrich Heine, 'Französische Maler, L. Robert' in Der Salon, Volume I, Hoffmann u. Campe, Hamburg, 1834. Edition of 1849 Online. p. 61, 62f. Translation ©FoS. Auf den goldnen Gründen prangen. Late today I went to the museum, where the saints, where the praying, are resplendent on golden grounds. Garben auf die Wagen legen. Then across the fields I walked towards the hot embers of the evening; watched those who had cut the corn today laying their sheaves on the carts. Wunderbare Goldesfarbe. Around the bundles in their arms, around the reaper and the sheaf, flowed the evening glow, the warm, wonderful colour of gold. Stand auf schimmernd goldnem Grunde. The last burden of the day and the diligence of the ceremony were all luminous with sacred dignity and also against a shimmering golden ground. Meyer repeatedly edited Auf Goldgrund over a number of editions. The definitive version, which is reproduced here, first appeared in Gedichte, third, revised edition, Leipzig, Haessel, 1887. Online. Translation ©FoS. The delightful task of watching other people work. It's easy to romanticise hard physical labour when you don't have to do it yourself, to see people who are tired, aching, hungry and just wanting to finish for the day as being engaged in some reverential, sacred act. 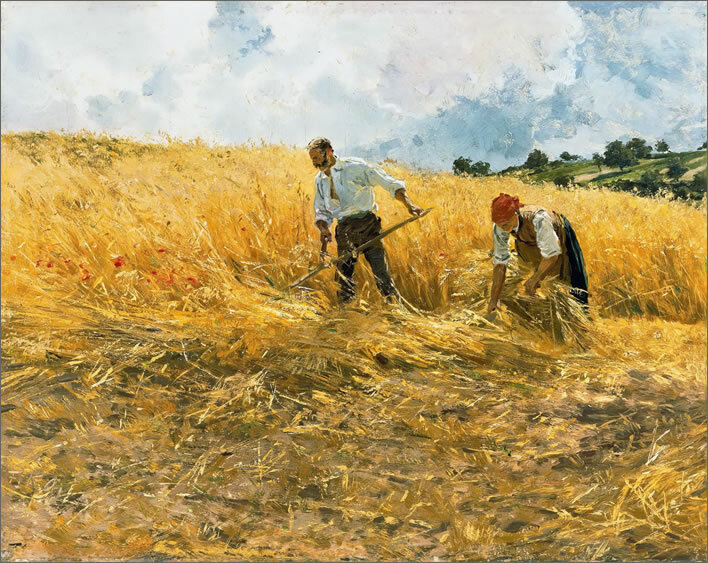 Friedrich Kallmorgen (1856-1924), Erntezeit, 'Harvest Time', 1891. Image: © Nationalgalerie | Alte Nationalgalerie, Staatliche Museen zu Berlin. Online.